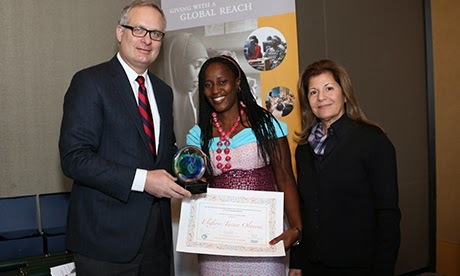 Dr. Taiwo Olayemi Elufioye of the Department of Pharmacognosy, Faculty of Pharmacy, University of Ibadan has won the 2014 Elsevier Foundation Awards, among four other women and would receive awards for Early Career Women Scientists in Developing World for their researches into the medicinal properties of natural compound. The award ceremony organized jointly by the Elsevier Foundation, The World Academy of Sciences (TWAS) and the Organization for Women in Science for the Developing World (OWSD) will hold at the American Association for the Advancement of Science (AAAS) annual meeting on Saturday, 15 February, 2014 in Chicago. Dr. Elufioye, who is the only woman from the Sub-Saharan Africa, will receive the award for her research on the medicinal properties of native Nigerian plants, with particular bias on the effectiveness of different species in treating malaria, wounds, memory loss, leprosy and cancer. Other winners are from Central & South Asia: Dr. Nilufar Mamadalieva of the Institute of the Chemistry of Plant Substances, Tashkent, Uzbekistan. From East and South-East Asia & the Pacific, Dr. Leni Ritmaleni of the Faculty of Pharmacy of Gadjah Mada University, Yogyakarta, Indonesia would be awarded for her work in the field of organic synthesis, focusing on the development of tropical medicines, with particular improved methods for the synthesis of sulfoxides and their application in the preparation of biologically active targets. Dr. Simone Ann Marie Badal McCreath of the Natural Products Institute of University of the West Indies, Jamaica, won the award from West Indies Latin America & the Caribbean region for her work in designing a new cell culture laboratory to investigate the cancer-fighting properties of Jamaican natural compounds. While from the Arab region, Dr. Eqbal Mohammed Abdu Dauqan of the Department of Medical Laboratories Sciences, Faculty of Medical Sciences, Al-Saeed University, Taizz, Yemen would be awarded for her research on the antioxidant properties of vegetable oils and specialized research in sensory evaluation and organic chemistry. The awards for these impressive women scientists represent a cooperative effort supported by Elsevier, OWSD, AAAS and TWAS to build research capacity and advance scientific knowledge throughout the developing world, and the annual AAAS conference is regarded as a better place to raise awareness among scientists, policy makers, journalists and the public about the need to retain and celebrate women scientists. In a statement by the University’s Director of Public Communication, Mr. Olatunji Oladejo and made available to IBPulse.com, the Vice-Chancellor, University of Ibadan, Prof. Isaac Adewole congratulated Dr. Elufioye on the award, saying that her feat is an inspiration to other women in science and a pride of Nigeria.